I am sooo excited to finally announce that my digital novelette, “The Shadow Cats,” will be published in e-format by Greenwillow/HarperCollins on July 17. Check out this cover. Isn’t it gorgeous? Greenwillow really knocked it out of the park. This 54-page story is an official prequel to The Girl of Fire and Thorns. It’s told through the eyes of Elisa’s older sister, the crown princess Alodia. “Once a century, one person is chosen for greatness. And it was not Alodia. So, yeah, it was super fun to get inside Alodia’s head. She remains an important presence in the next two books in the trilogy, so I hope this will give readers a glimpse into what makes her tick and enrich their overall experience. “The Shadow Cats” is now available for pre-order wherever ebooks are sold. Buy early, buy often! My starving kitties thank you. I thank you. Hope you enjoy! OKay, I never ever read novelettes, but for serious, I will TOTALLY buy and read the heck out of The Shadow Cats. Can’t wait!! So happy to get to know Alodia a bit! love both books – briliant! 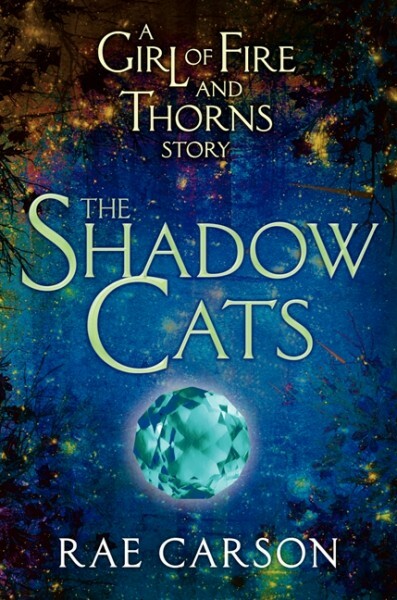 when will the Shadow Cats be available in the UK? Thanks for one’s marvelous posting! I quite enjoyed reading it, you could be a great author.I will make sure to bookmark your blog and will often come back in the foreseeable future. I want to encourage you to continue your great work, have a nice day! My family members every time say that I am killing my time here at net, however I know I am getting experience all the time by reading such fastidious articles. Spices or herbs assistance to burn fat, but the same is true and the option of eat. It is also you simply crucial to note which you do not absolutely must eat three meals every and each day. have unsaturated fats with a wealth of vitamins and minerals. and they often have a tendency to put things inside their mouth or play in a way which may hurt them grievously. Thanks for your whole labor on this web page. My mother really loves setting aside time for investigations and it’s obvious why. I notice all concerning the dynamic tactic you create very helpful tips and hints through this blog and in addition boost response from website visitors about this area of interest plus our own simple princess is truly studying a lot. Take advantage of the rest of the year. You’re the one doing a pretty cool job. Fantastic web site. Plenty of helpful info here. I am sending it to several friends ans additionally sharing in delicious. And certainly, thank you for your sweat!